From Tadasana step one leg back. Take the hand from the arm that is behind you down on the mat beside the leading leg. Placing it on the outside or inside of leg depending on your spinal flexibility. The easier version has the hand on the inside of the leading leg and for an even easier version the front leg can be bent a little. 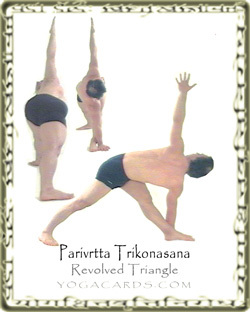 Allow the twist to occur from the lower back to the top of the neck. Try to align the arms vertically. Look up but if the neck hurts look sideways so it is not twisted. Sometimes looking down then up a few times can help to relieve muscle pain in the neck while performing this yoga pose. Common faults occur in the back foot and the front foot. The outer edge of the back foot has a tendency to come off the mat. Try to push down on the pinky toe of the back foot. On the front foot weight shifts to its outside when you twist. To prevent this push down on the inside of the big toe.